Inflammation is a natural process. It is one of the primary ways the immune system fights off infection and protects the body. However, excess inflammation causes a host of health problems. Allergies, arthritis, chronic pain and heart disease are only a few of the diseases associated with an inappropriate immune response. Making the right dietary choices can help regulate the immune system and prevent illness. Below are some general guidelines for optimizing your diet and decreasing inflammation. By following these instructions you can take the first important step in preventing pain and promoting health. 1) Relax and enjoy your food. Your state of mind affects your health at least as much as what you eat. 2) Avoid all of your known food allergens, sensitivities and intolerances. These will trigger an inflammatory reaction in your body. 3) Try to eat whole, unrefined foods whenever possible. These provide a broad spectrum of vitamins, minerals, fatty acids and phytochemicals that balance immune functions. Choose whole grains over refined grains, freshly prepared foods over packaged foods, etc. 4) The type of fat you eat has a profound effect on your immune function. Emphasize foods rich in omega 3 fatty acids such as wild salmon, flax seed, hemp seeds and raw walnuts. Minimize foods high in omega 6 fatty acids such as corn oil, soy oil, peanut oil. Minimize foods high in arachidonic acid such as commercially raised, grain-fed meat. Strictly avoid all hydrogenated oils; they promote inflammation. 5) Balance your blood sugar. Blood sugar imbalances such as hypoglycemia are very stressful for the body. They exhaust your adrenal glands and inhibit the production of natural anti-inflammatory hormones like cortisol. Eat smaller, more frequent meals. Avoid simple sugars and highly refined carbohydrates. Always eat some protein or fat with complex carbohydrates so they will be absorbed slowly. 6) Avoid nightshade vegetables. In sensitive people the nightshade vegetables, potatoes, tomatoes, peppers and eggplant can trigger musculoskeletal inflammation and pain. The only way to find out if you are one of these people is to avoid the nightshades for six weeks and see if your symptoms improve. Then re-introduce them for a week and see if your symptoms come back. Remember to read ingredients; potato starch, tomato sauce and chili pepper are hidden ingredients in many foods. Incidentally, tobacco is also in the nightshade family. 7) Eat high enzyme foods such as pineapple, green papaya, kiwi and sprouted seeds. These enzymes will promote digestion and reduce food allergies. They can also be absorbed into the blood stream where they break down immune complexes and reduce inflammation. 8) Eat darkly colored fruits and vegetables. 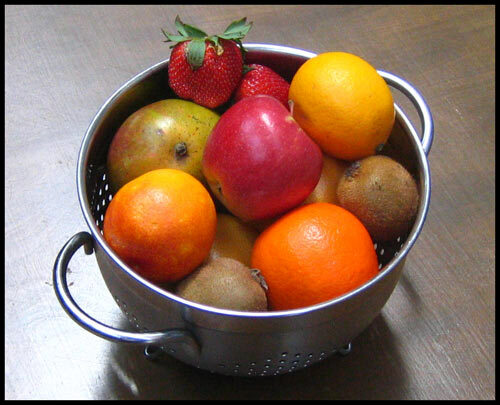 The pigments in fruits, vegetables and spices are often potent anti-inflammatories. Fruits such as blueberries, blackberries and cherries and vegetables such as carrots, kale and turmeric should be consumed every day. 9) Balance your gut flora. Our gastrointestinal tract is not sterile; it is a balanced ecosystem of bacteria and yeasts. Unfortunately the modern diet and use of antibiotics tends to throw this ecosystem off. This has a profound effect on the immune system because 50% of your immune cells are concentrated in and around the gastrointestinal tract. Consuming plenty of fermented foods such as yogurt, sauerkraut and miso can help to restore beneficial flora and balance your immune response. Probiotic supplements, especially those high in bifido bacteria* have been shown to decrease allergies and inflammation. *Oral Bifidobacterium modulates intestinal immune inflammation in mice with food allergy. J Gastroenterol Hepatol. 2010 May;25(5):928-34. Zhang LL, Chen X, Zheng PY, Luo Y, Lu GF, Liu ZQ, Huang H, Yang PC.